Comes standard with 3 antique brass Cup Pulls and 6 antique brass double hooks. 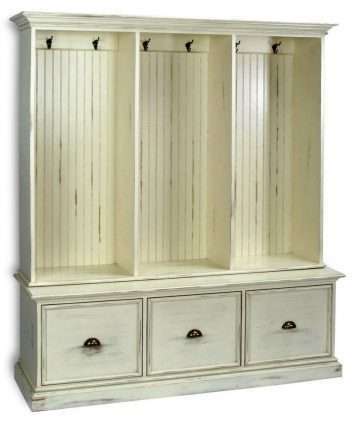 Features three coat sections with 2 hooks each and a beadboard interior back, and 3 drawers on metal/nylon drawer glides. The top section is set back 6″ from the front of the base section. Ships in 2 corrugated cartons: Cabinet top (94 lbs) and cabinet base (117 lbs), on 1 wooden pallet (70 lbs).